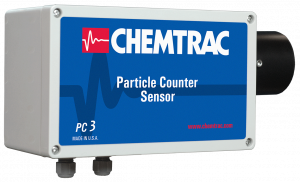 Particle Counter Sensor PC3 | Chemtrac, Inc. The PC3 Particle Counter Sensor, when combined with a HydroACT analyzer, represents the most affordable option in Chemtrac’s family of Particle Counters where multiple sample monitoring points are required. For larger installations, 4 to 12 sensors (depending on the number of size channels used) can be connected to a single HydroACT 1200 analyzer. The PC3 Particle Counter Sensor, when combined with a HydroACT analyzer, represents the most affordable option in Chemtrac’s family of Particle Counters where multiple sample monitoring points are required. For larger installations, 4 to 12 sensors (depending on number of size channels used) can be connected to a single HydroACT 1200 analyzer. The HydroACT platform even allows the user to combine other measurements (like pH and chlorine) with particle counting, which helps reduce overall cost by reducing the number of analyzers. Full integration between the remote sensor and analyzer means all sensor settings, including user-friendly calibration features, can be accessed from the HydroACT’s user interface. The PC3 is an ideal choice for filter effluent and clean liquid monitoring applications where only 1 to 3 size channels of particle measurement are required. A larger flow cell helps make this sensor easier to clean, and also reduces overall installation footprint due to the more compact flow control weir design. For very low levels of suspended solids, particle counting is very often a better alternative to other traditional measurements like turbidity and SDI. Contact Chemtrac to discuss your application and let us find the right solution for you. Chemtrac was one of 16 exhibiting sponsors at the 21st International Conference on Water Chemistry in Nuclear Reactor Systems. The conference took place on September 9-14 in San Francisco, and the Electric Power Research Institute (EPRI) hosted the event. 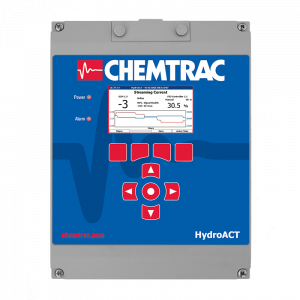 The Lab Charge Analyzer will be featured at the Chemtrac Booth (#2025) during the upcoming AWWA ACE17 conference and exhibition, June 11-14. The Chemtrac team joined attendees at ACE 2016 in Chicago, IL to discuss the latest models of Streaming Current Monitors, Particle Counters, Chlorine Analyzers, and HydroACT multi-parameter analyzer. We will be introducing two new series of products at the 2016 AWWA Annual Conference & Exposition in Chicago next week (June 19-22). Happy Birthday Chemtrac, Inc. — Thirty One-derful Years! We are happy to say that this month marks the 31st anniversary of Chemtrac, Inc.